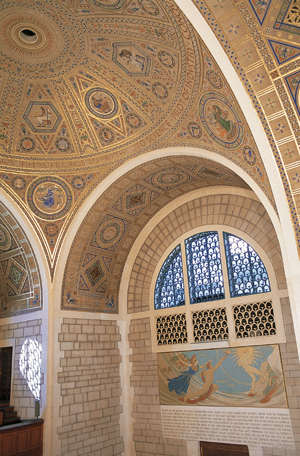 When the National Academy of Sciences' home was built in 1924, architect Bertram Grosvenor Goodhue incorporated the work of artists, sculptors and muralists to adorn the building with striking visual elements. These works define the space, communicate the history of science, and enhance the experience of those who visit the NAS. Continuing in this tradition, Cultural Programs of the National Academy of Sciences (CPNAS) explores the relationships among culture and science, engineering, and medicine through rotating art exhibitions, a permanent art collection, and a series of public programs that include theatrical readings, monthly salons called DC Art Science Evening Rendezvous, film screenings, and lecture.